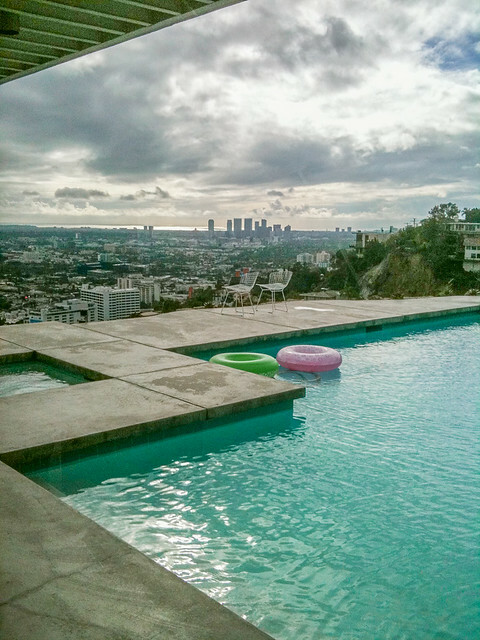 There’s this photograph of Los Angeles that I love. It was taken at night in the 1960’s; two young women sitting in a modern, glass-walled living room perched on the edge of the Hollywood Hills. The valley below is lit up with twinkling lights for as far as you can see and their house seems to float over the city. It’s a glimpse into a quiet moment and an excellent vantage point for admiring the city. 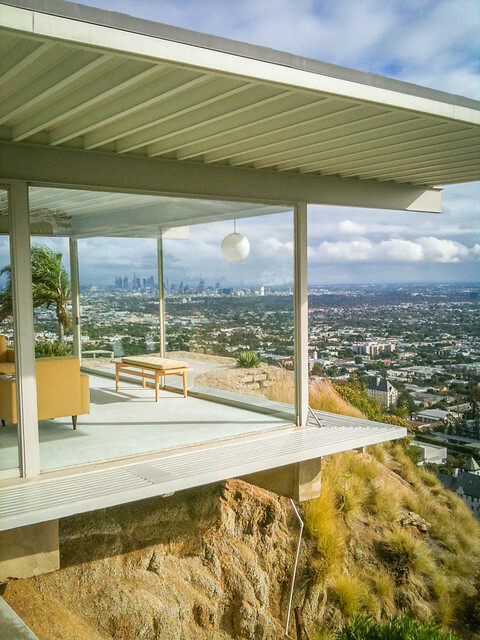 Here’s the photo, taken by midcentury architectural photographer, Julius Shulman. 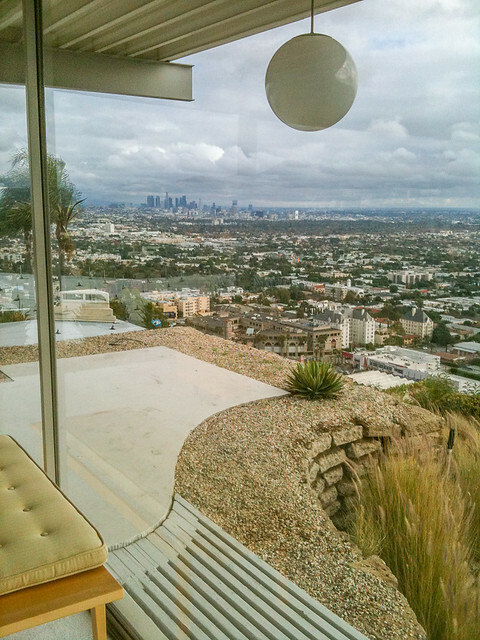 I was excited to find out that you can visit this home and see this famous view yourself. 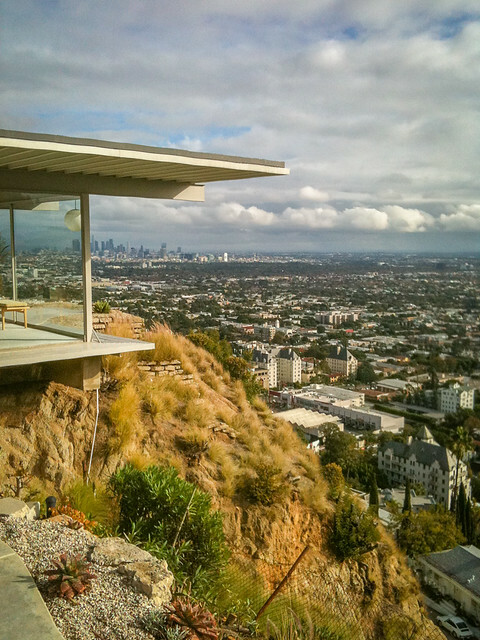 The Stahl House (also called Case Study House #22) was built by architect Pierre Koenig in 1960, it was originally part of the esteemed Case Study House program and it’s considered one of the more historic buildings in Los Angeles’ 20th Century modernist architecture. The Stahl Family commissioned design and construction of the house back in the 50’s and continues to own and operate it. One of the original owners (Carlotta Stahl) lived in the house until just recently, vacating it on occasion when the home was rented out for special events and movies and TV filming. On our visit, the family’s youngest son, Mark Stahl gave us a short tour of the house, complete with stories from his childhood growing up in the house. Those (pre-tempered) pane glass windows, sharp concrete corners, and back patio perched over a steep and rocky cliff look like a death trap for a raucous group of young boys. Amazingly, they all made it out alive! 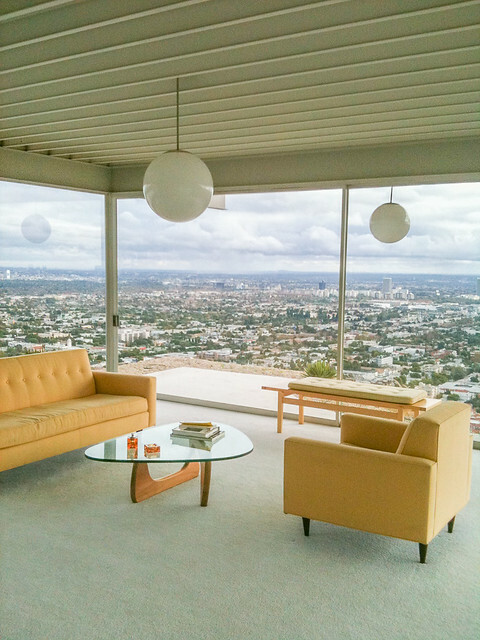 I found these photos from our 2009 visit to the Stahl House just this week, hidden in a set of photos I had snapped on my phone. I had thought the only pictures I had taken were lost forever in an hard drive failure, so I was thrilled to have the chance to, once again, enjoy this excellent view. It was such a clear day, we got really lucky with the weather! Thanks for this peek at such an icon. Love the clean lines. I’ll be sure to visit there when I’m in LA in May. Wishing you safe and happy Japan travels! This is so great! 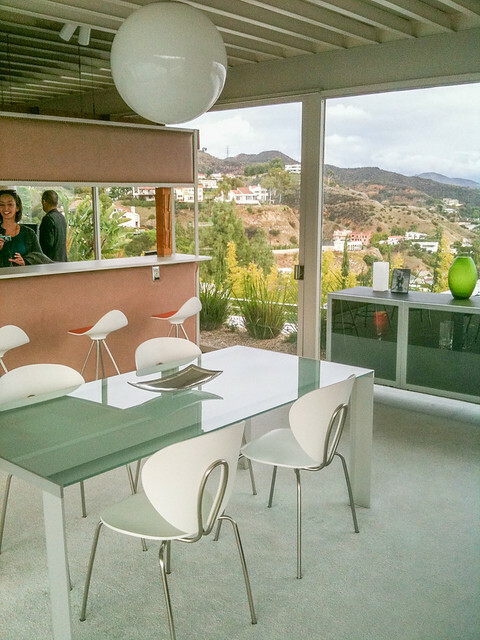 I never knew you could tour any of the Case Study houses. I’m def doing this next time I’m down there. I also never knew it was possible to see Downtown from more than 10 feet away. Wow, nice smog-free day. Hi Garrick, I was surprised by that too! And yes, we got really lucky on the weather! Winter (after a heavy rain) is no-doubt the best time to go for best chance of visibility. I think it had actually been raining that morning and I worried the visit woudl be rained out but it held up just long enough to see these amazing views! Definitely putting this on my to-do list for LA. Great, I think you would really enjoy the architecture, Jenna. Go in the winter after the city gets some rain so you get the best view! That truly is an iconic photo, so it’s terrific to know that the house is available for tours. I’m definitely adding it to my wish list for the next time I visit LA. What a nice feeling to find photos that you thought were gone for good! My gosh, I feel so lucky–when does that ever happen! I wish I hadn’t lost the higher quality camera ones, but these cell phone ones are just fine!